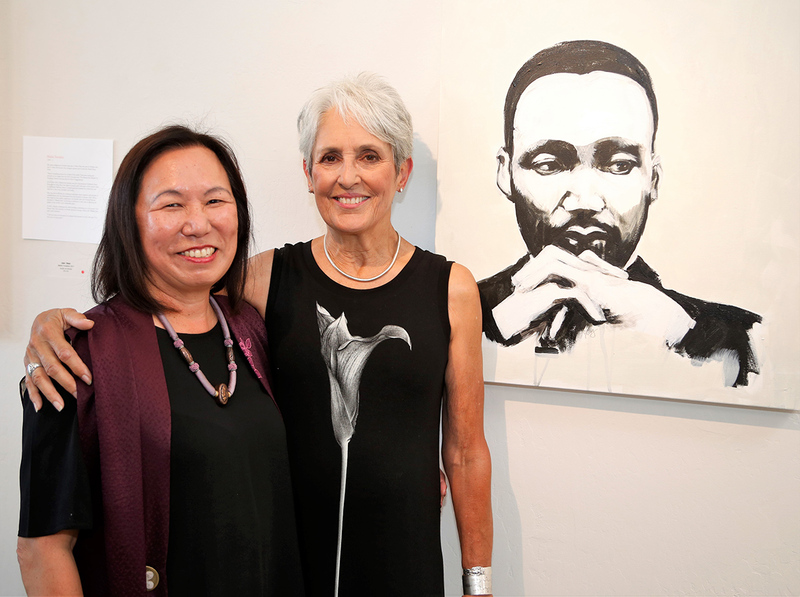 A collection of 14 portraits painted by singer and activist Joan Baez and inspired by a diverse group of architects of social change has been donated by the Federated Indians of Graton Rancheria to Sonoma State University in commemoration of the university’s historic commitment to civil rights and social justice. That’s also the title of her first art exhibition that has made one stop at the Seager/Gray Gallery in Mill Valley through September before most of the paintings find their permanent home at Sonoma State. “I met Joan a while back, saw the paintings and I was so moved by them,” said Greg Sarris, chairman of the tribe that owns and operates the Graton Resort and Casino near Rohnert Park. Sarris also holds the Graton Rancheria Endowed Chair in Writing and Native American Studies at Sonoma State. 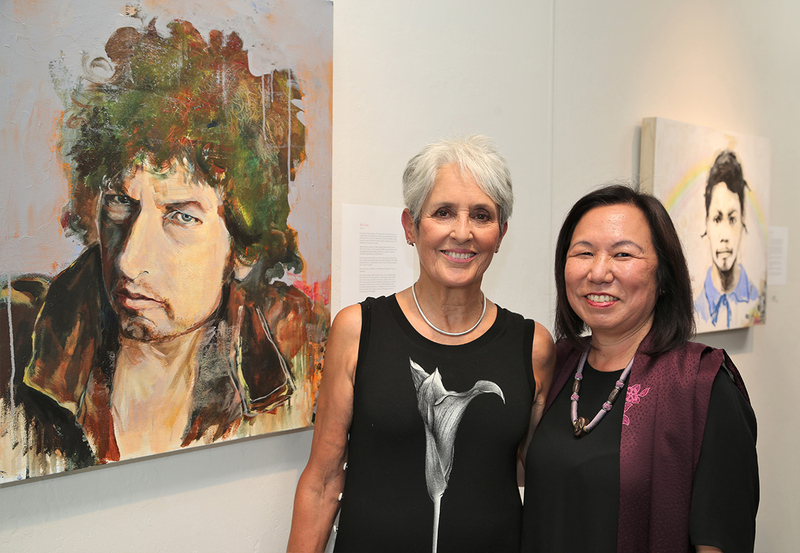 Sonoma State President Judy K. Sakaki, who has made social justice a theme of her presidency since taking the job in July 2016, said the paintings will be temporarily displayed at the university’s Green Music Center, where Baez will visit on Oct. 26 at a private fundraising event for the University. Tickets are $300, with proceeds going to help the campus create the center Sarris and Sakaki have envisioned. Information about how to secure tickets can be found at gmc.sonoma.edu. Members of the general public can also view the paintings at two public showings scheduled for Saturday, Oct. 28, 4–7 p.m. and Thursday, Nov. 2, 10:30 a.m. – 1 p.m. They will also be available for viewing during performances at Weill Hall through Nov. 13. “Dr. Sarris and the Federated Indians of Graton Rancheria have provided tremendous support for the university and we are grateful,” Sakaki said. “These striking portraits of political activists known for their devotion to social justice are a wonderful addition to our campus. Baez said she was delighted that her paintings will have a permanent home at Sonoma State. Sonoma State has a long history promoting social justice and regularly involves students, faculty, staff and members of the community in such events as the yearly student-organized Social Justice Week, the H. Andrea Neves and Barton Evans Endowment Lecture Series held each spring and an annual Holocaust Lecture Series sponsored by the university’s 30-year-old Center for the Study of the Holocaust and Genocide. Social justice is also a priority for Sarris. Under his leadership, the Federated Indians of Graton Rancheria has been promoting regional economic development, education, social services, and environmental sustainability for the tribe and other under-represented groups in Sonoma and Napa Counties. In media materials prepared for her exhibit at the Seager/Gray Gallery, Baez made it clear that her paintings—like so much of her music over the decades—were designed to make a strong, and unambiguous political statement. The 76-year-old Baez has been painting and drawing for years, but she’s been spending more time working on her art of late after cutting back on her busy touring schedule. 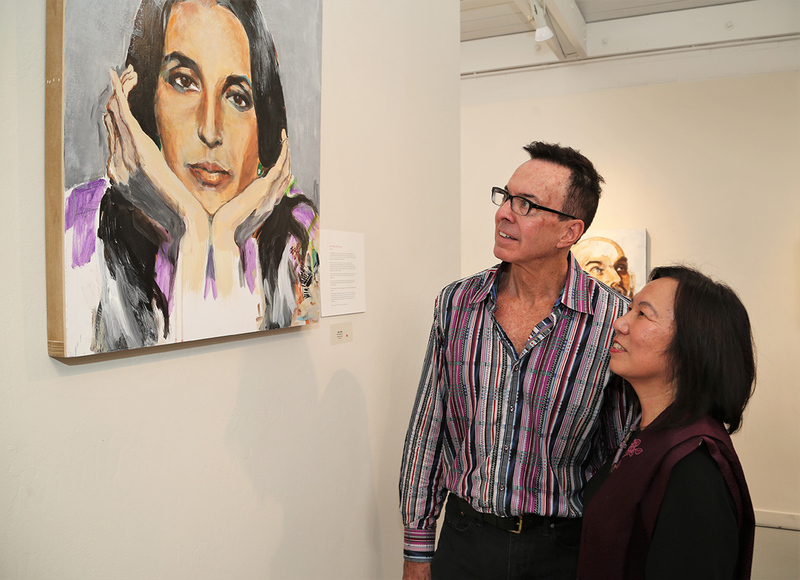 The portrait collection donated to Sonoma State also includes Baez’ acrylic-on-canvas paintings of Dolores Huerta, who co-founded the United Farmworkers; author Maya Angelou; Singer and activist Harry Belafonte; two portraits of Aung San Suu Kyi, the Nobel Peace Prize winning pro- Democracy activist in Burma; Vaclav Havel, who was the first president of the Czech Republic after communism fell there in 1989; Marilyn Youngbird, an internationally renowned Native American teacher, healer and political activist; Ram Dass, an influential author and spiritual leader; David Harris, who was once married to Baez and served time in prison for resisting the Vietnam War draft; and William Barber, a North Carolina pastor and civil rights leader. The Federated Indians of Graton Rancheria were restored as a federally recognized tribe in 2000. The nearly 1,400-member tribe consists of both Coast Miwok and Southern Pomo people. Their tribal ancestors existed for thousands of years in what is now Marin and Southern Sonoma counties. Under the leadership of its Tribal Chairman, Greg Sarris, the tribe is the owner of Graton Resort & Casino. Founded in 1961 as a teacher education center for the North Bay, Sonoma State University is now a liberal arts and sciences university dedicated to providing high-quality undergraduate education and professional graduate programs to its 9,400 students. Dedicated to the liberal arts and sciences and known for its active use of technology, the SSU educational experience fosters intellectual, cognitive, social and personal growth. The faculty and staff of Sonoma State provide close mentoring relationships and an education that fosters ethical exploration, civic engagement, social responsibility, and global awareness combined with a solid foundation in an academic discipline. Sonoma State is the home of the Green Music Center and Weill Hall and is part of the 23-campus California State University system.